I won’t be parted from my brushes. It doesn’t matter if I’m only leaving home for a single night, I can’t make do with powder puffs and spongey applicators now that I’m used to brushes. Which can be a bit of a problem when I’m travelling to far flung exotic lands (Bournemouth, London, Darlo). I took one of my MAC 217s away with me the last time I travelled to London and damn near killed the poor thing. Flapping about in my makeup bag, it returned home looking like Leila had painted the walls with it and it’s so far resisting my best efforts to coax it back into shape. 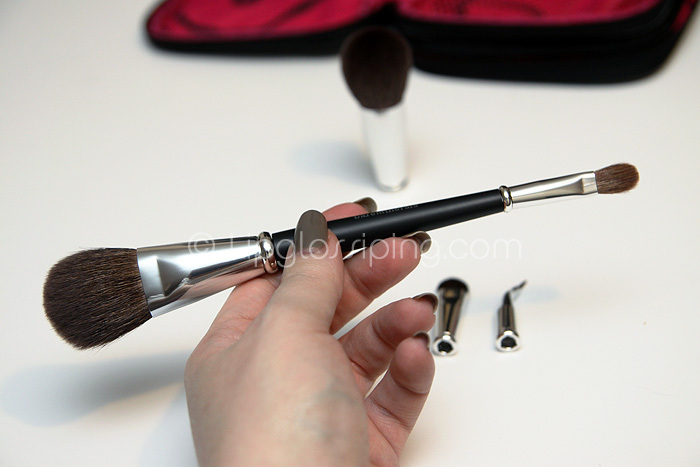 A magnetic brush collection with carry case! Great! 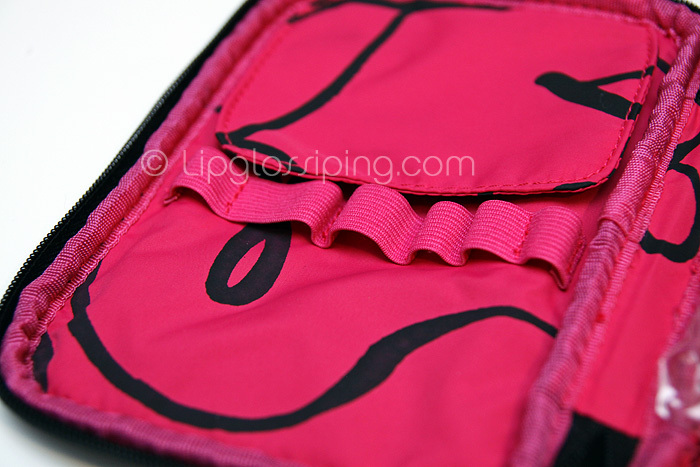 Another cosmetic ‘innovation’… can you see my eyes rolling? Except… this is actually useful. But does it work in practice? 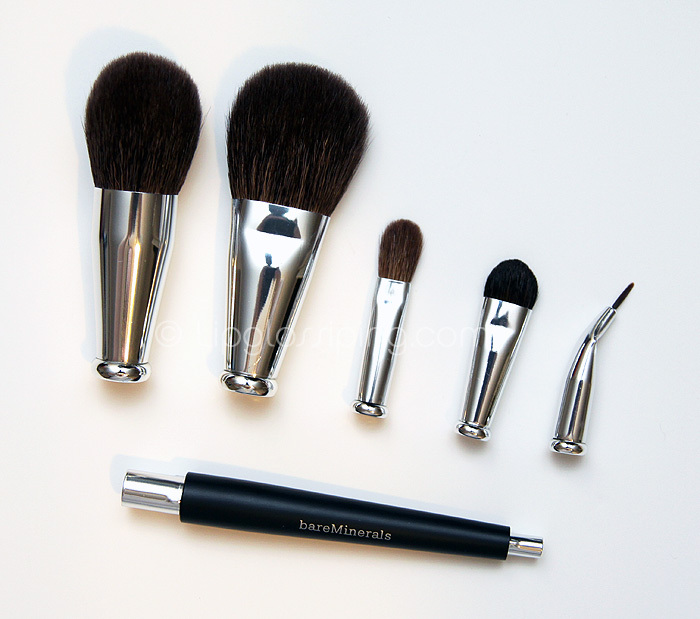 Presented in a good quality carry case (that will easily store a lot more than just your brushes), Bare Escentuals Brush with Genius Brush Set is a well thought out set of core brushes that would cover the basic brush needs for most women. 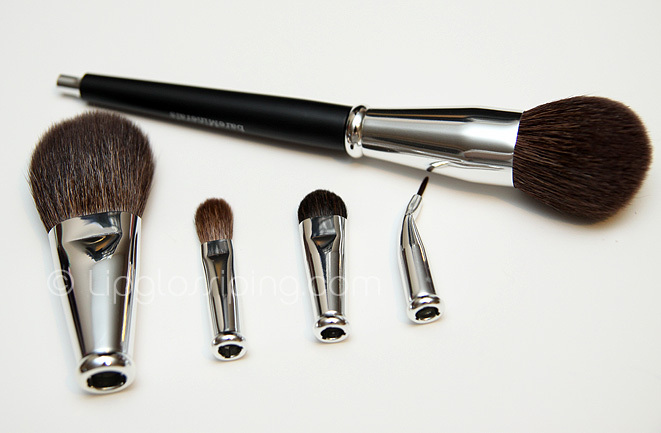 Five brush heads and one double-ended handle are included in the set. 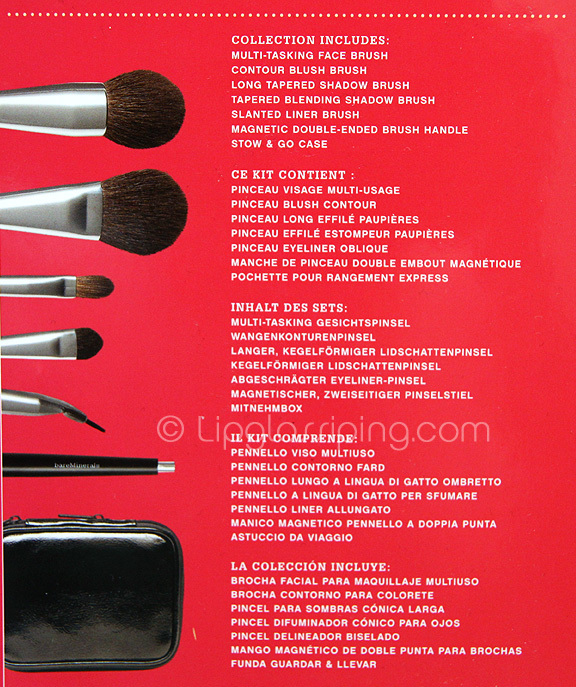 The heads are comparable in quality and softness to Bare Escentuals stand alone brushes. Densely packed and well cut, I’m particularly a fan of the pointed multi-tasking brush and the tapered eye blending brush (though n my opinion, it’s a bit too firm for blending). But how about the actual magnetic system? Well… it works very, very well. The brush heads lock securely into place and after almost a month of use, they have retained a tight fit. I wondered if the set might be let down by wobbly brush heads – this hasn’t been an issue for me at all. 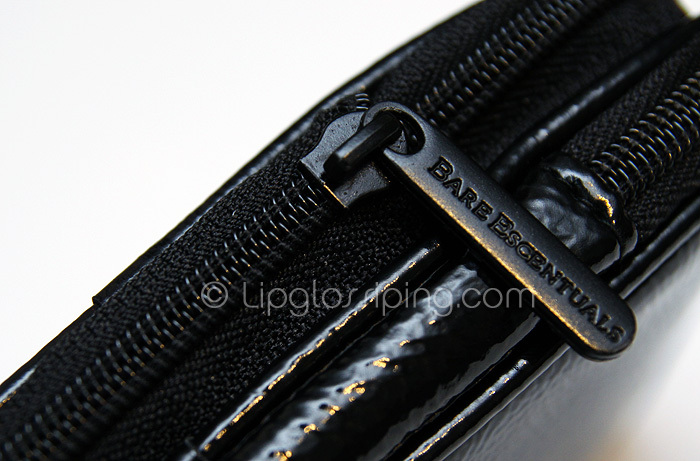 The two larger heads slot onto the wider end of the handle, whilst the small eye brushes occupy the narrow end. It has a lovely weighted feeling in my hand (thanks I’m sure, to the magnets) and it’s a delight to hold and use. 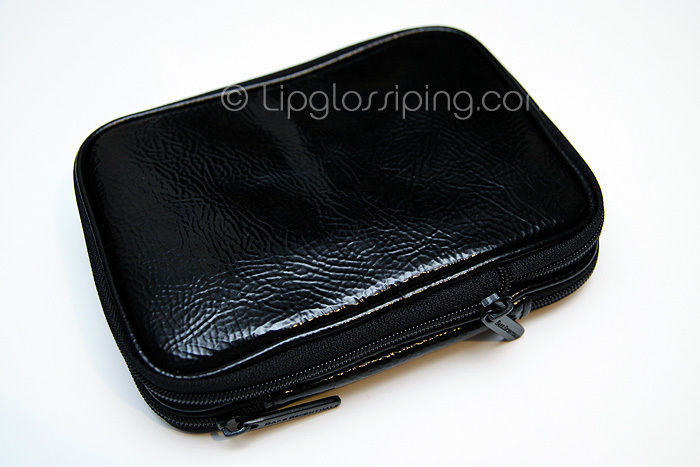 This would make a good gift choice for someone who doesn’t want to compromise on the quality of their brushes when they travel. 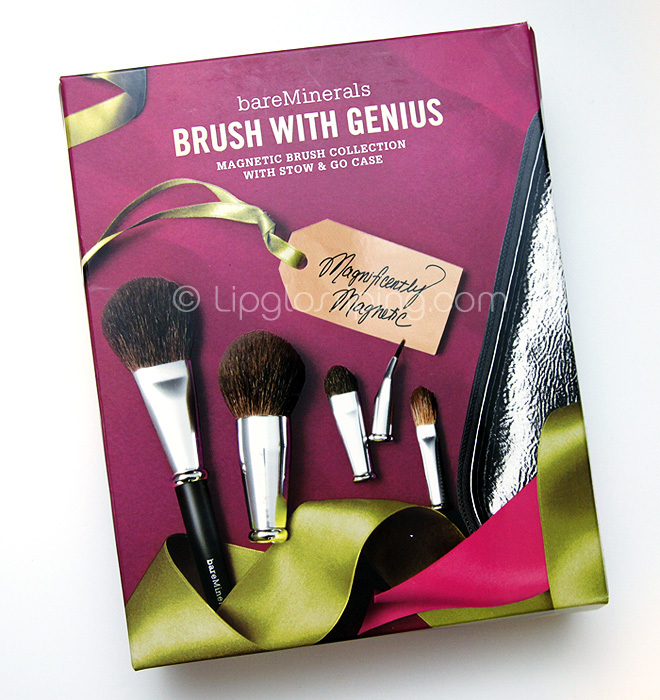 Bare Escentuals Brush with Genius Brush Set is available from this month (November) and only from Bare Escentuals stocked Spas and Salons. You can find your nearest by using their salon locator. 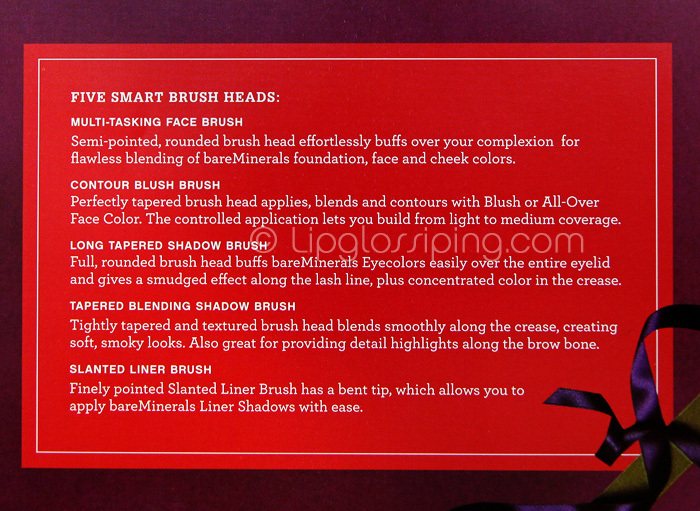 Good idea, but I hate BM brushes—they are way too harsh!! Excellent idea! Wish more companies would pick it up! 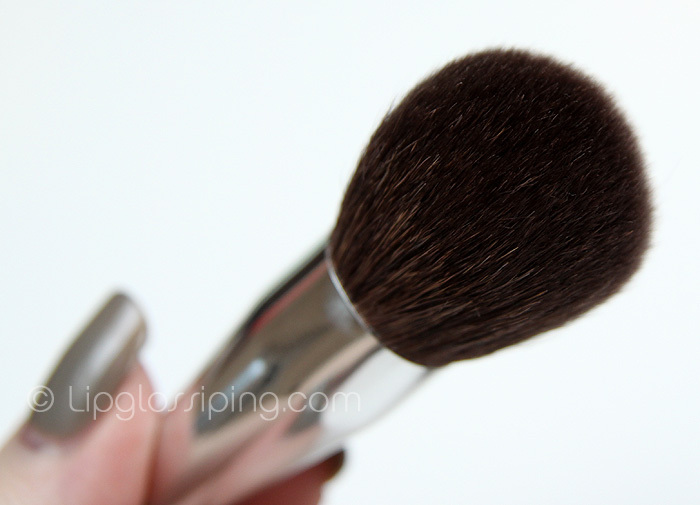 I actually love Bare Escentuals brushes, blogged about the starter kit which includes three of their brushes, which are lovely and thick and soft too. This idea looks genius, I may even invest in them for travelling! hehe I got this too and have pretty much an exactly matching review written, really impressed with this. My recent post: What I am wearing today!!! That is a great idea and so useful! That’s actually a really cool idea! When I first looked at the photo of the box I did a double take, and then was like ‘what the…..? :|’ you’ve convinced me though! That is freaking genius! They sound like a fab idea. Great pics by the way. I have a request for a post, actually. I want to buy my 14-year-old goddaughter a set of basic but decent brushes for Xmas, to get her started properly. I can go to about 20 quid and for that I’d hope to get a couple of eye make up brushes and a blusher brush she could use for bronzer as well. I don’t think she’d need foundation or powder brushes, but I think a concealer brush would be very useful too, given the whole ‘teen zit’ trauma. There are lots of different sets and kits out there, but it’s hard to know which ones are decent quality and will be a good present and make it easier for her to get a good result. Wow. That’s pretty awesome I like!